You may have noticed a lack of posts lately. Summer is here, and the blog always suffers for it. 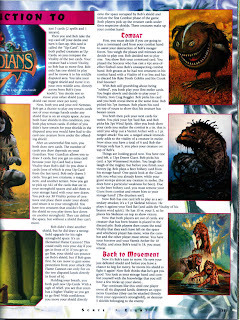 In addition, I've been putting some work into my Arcadia CCG blog, The Wyld Hunt, which I have neglected for 2 years. It will probably be a few weeks before I post again. In the meantime, I wanted to share with you some cool stuff I found. 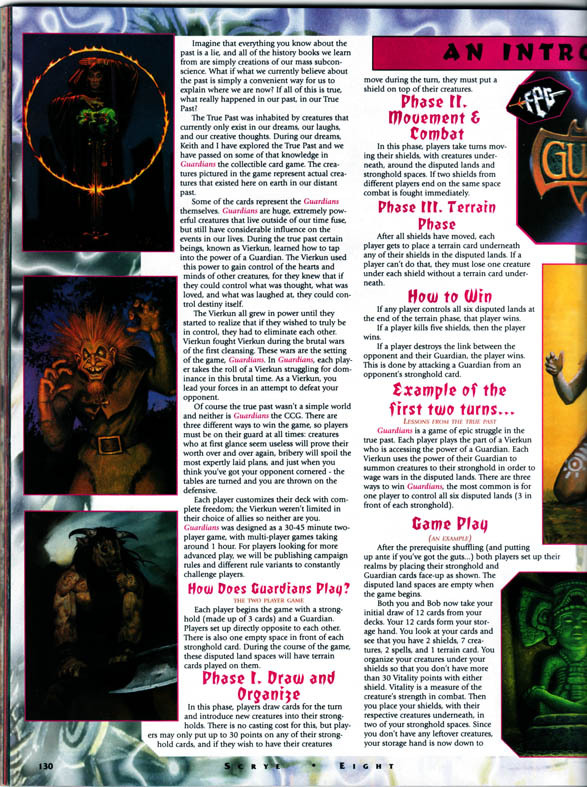 On his website, Phil has an "Articles" section where he shows Guardians material that appeared in magazines. I happened to order issue #8 of the now-defunct Scrye Magazine for some other material, but was surprised to find some Guardians-related content in the magazine. One thing I really like about the article is that it spends some time explaining what a Vierkun is, probably the most information I've seen about that name up to this point. 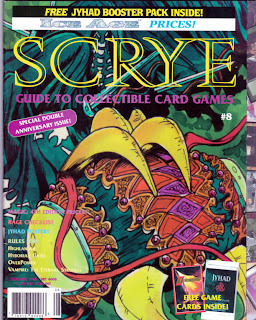 Oh, the good old days, when Inquest was in its teensm and you had Scrye and Imagine. I remember openin the Jyhad pack, as I was actually playing that game, along with MTG, Bloodwars and Guardians. I really have to question why FPG chose the Warrior Spirit image for the ad, 90% of the other cards have far better artwork. Also, I feel the same about the images chosen to accompany the article, but these might have been the choice of the author of the article. 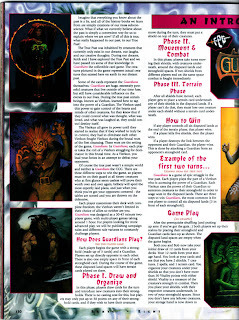 I'm pretty sure if instead of Goblins, Black Lung and the Earth Mother, images of Phantom Stalker, Dragon Wing Lord and the Barrow Wight might have actually convinced a few more people to give the game a go. 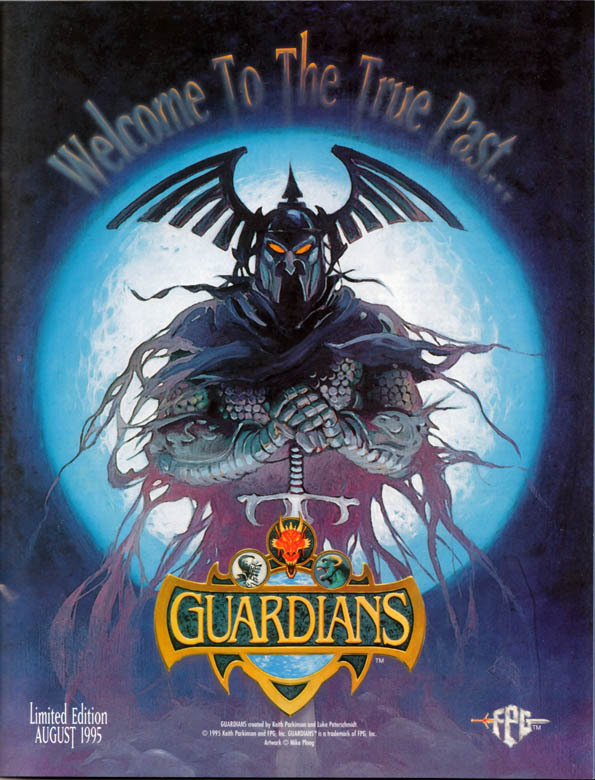 I don't think the choice of card art had anything to do with Guardians not reaching critical mass. The base set had great success, the CCG glut as well as a real lack of organized play is what killed the game. 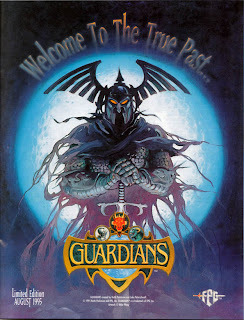 I'd say fully 40% of the MTG players at my college (circa 94-96) picked up Guardians and liked it, but it had to compete with the big boy MTG, and also SW, Star Trek, Rage, Jyhad, Netrunner, etc, etc, etc, etc. It's uniqueness and 'replayability' got buried in the landslide of dreadful MTG clones.